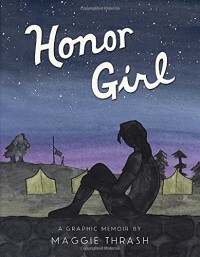 A touching memoir that every teen will be able to relate to, HONOR GIRL is the story of Maggie's most special summer at Camp Bellflower for Girls. Maggie's always been just another girl at camp, one who's just a little more into Backstreet Boys than anyone else and doesn't really like group activities. Until this one summer, when she starts feeling strange things for an older camp counselor who happens to be female. Maggie has never had an interest in the boys who work around the camp, but she's never been interested in girls, either. Watching Maggie fall for Erin and sort through her chaotic mess of feelings is so familiar, so relatable, that she could be writing about anyone. The story of Maggie's first love is deliciously awkward and hopelessly appealing. Combined with the always-a-little-weird summer camp setting and Maggie's own unique voice and that makes HONOR GIRL a very enjoyable book. With sketchy, light illustrations painstakingly colored in watercolor paints, HONOR GIRL's graphic elements reflect its casual yet unique tone. 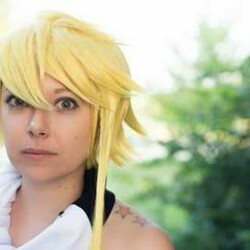 The characters are well-defined and interesting, with their own set of expressions and quirks. The Verdict: HONOR GIRL is an honest, relatable, and touching story of one girl's summer of self-discovery.